Pulsatilla in general are known as the Pasque flower, however with around 30 species they do vary greatly. It is Pulsatilla vulgaris that is the most commonly grown form, reaching around 30cm, soft finely haired light green foliage and flowers that seem ‘just a little big’ for the plant. 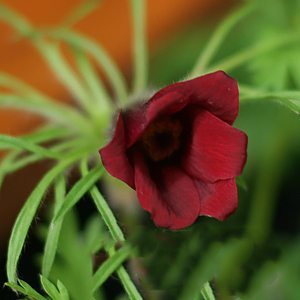 Even within this species, a few variations are around, some with deep red flowers some with bluish purple. P. vulgaris papageno having largish pink flowers, ‘pearl bells’ with its creamy white flowers, and the lovely ‘red bells’, deep red flowers as the name suggests. A sunny position in a humus rich soil, with a little protection from the hot afternoon sun is best. Try the rock garden where they will form a lovely clump over time, or perhaps grow them in a pot or container. Best grown in a humus rich moist soil, a position in full sun to afternoon shade is best. In good conditions they will self seed and look excellent in a wildflower meadow type planting. Once established they are reasonably drought tolerant and require little extra care. Good drainage in winter is essential. Clumps can be marked and divided in autumn if required. Prune right back in late autumn to tidy up. Pulsatilla halleri ssp rhodopaea a wonderful spring flowering species from Greece through to Bulgaria. Here it grows in open grasslands, we think a little lime in our soils may be of assistance. Pulsatilla occidentalis with its creamy white flowers is another worth looking for. Pulsatilla alpina ssp. apiifolia with its yellow flowers is another, although rare in Australia.